Of all injuries, the most feared among footballers is knee injuries. No injury is pleasant, but football knee injuries are the particular ones that can bring the whole show crashing down. For players over a certain age (and also a large portion of younger guys too), dodgy knees are a constant worry, and they’re the body part most likely to end their involvement in football. For many, playing football seems like one large battle of man vs joints – and we’ve lost so many comrades in that fight already. In this article we’re going to be looking at knees – what the issue is with them and what you can do to keep yours in tip top condition. And all this with the help of expert Physiotherapist, Nell Mead, Clinical Director of London-based Victory Health & Performance. The reality is that knees were designed to help us bend, walk and run – but they weren’t designed with football in mind. In fact, if our knees were to come with a warranty it’s more than likely that the fine print would exclude any damage suffered as a result of playing football: they just weren’t designed with this in mind. 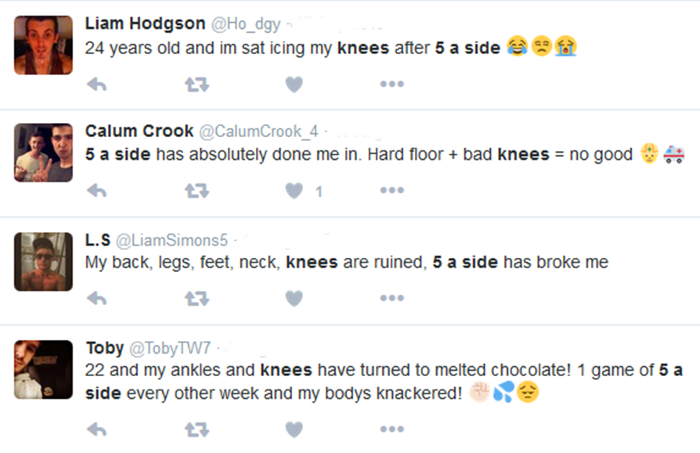 A lot of people can play without any problems with their knees whatsoever but, as the selection of tweets above shows, there are a lot of people suffering with dodgy knees – and these aren’t even old guys in a lot of cases. It’s these movements that are the problem, and result in two main types of knee injuries: stop-start injuries and twisting injuries. We’ll explore both in more detail below. This is the A-lister of football knee injuries, and the one you hear most often talked about: the anterior cruciate ligament (“ACL”). Your ACL connects your femur (that’s your thigh bone) to your tibia (your shin bone) in the centre of your knee. It limits rotation and the forward motion of the tibia (the lower part of your leg). If you tweak your ACL, you’ll be looking at a few months out from playing football (it’s a terrible idea to try to play through it), but if you tear it then you may need an operation, and you will definitely need a lot of physiotherapy and rehabilitation, before you’ll be back playing again. 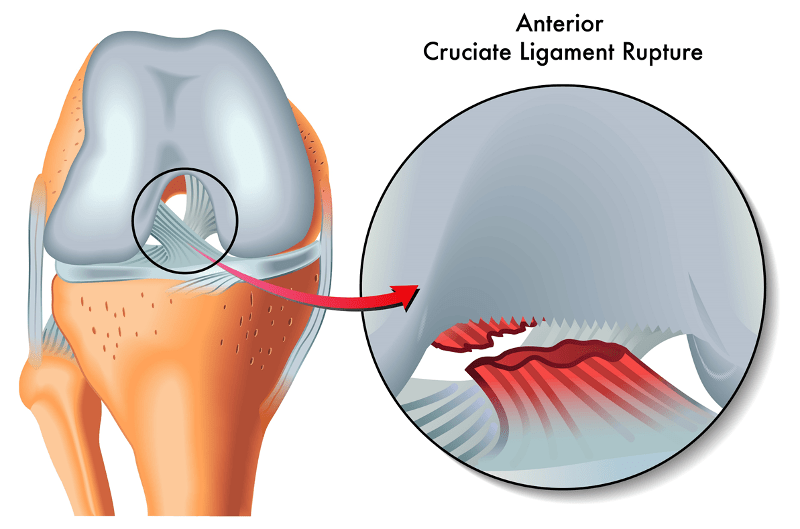 Not everyone who has ruptured their ACL needs surgery, but the majority do; and you will certainly need to see both a physio and an orthopaedic surgeon. Every group of footballers has got at least one eye-watering story about someone who ruptured their ACL. Sadly, it’s all too common. The NHS estimate that around 17,000 ACL injuries occur in the UK each year (though not all are football related, of course). Crazy how much pain & mental anguish that little guy causes when torn! A different type of football knee injury is also common: one that’s caused more by twisting and turning. This cartilage absorbs shock in your joints, but when it’s gone it’s gone. 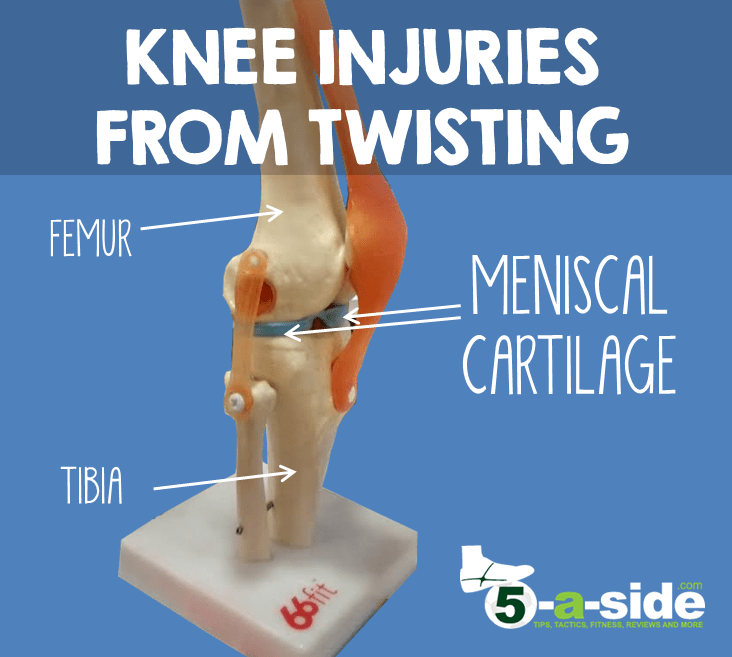 “Meniscal cartilage has a poor blood supply and isn’t good at repairing itself”, says Nell. The above makes grim reading, and clearly you want to avoid any sort of knee injury. The truth is, it’s hard to predict exactly when or where a knee will succumb to injury, but there are some telling indicators of when it’s likely that you’ll do yourself some damage. If that sounds like you, then you could be a ticking time bomb here. In that case it’s time to turn things around and sort out those dodgy knees before they get any worse. What can I do to avoid a football knee injury? People assume that the way to avoid knee injuries is simply by strengthening the knee. Whilst that may help, it’s only half the story. Rather than just strengthening the knee to deal with stresses placed on it, it’s often worth tackling the cause of those stresses. 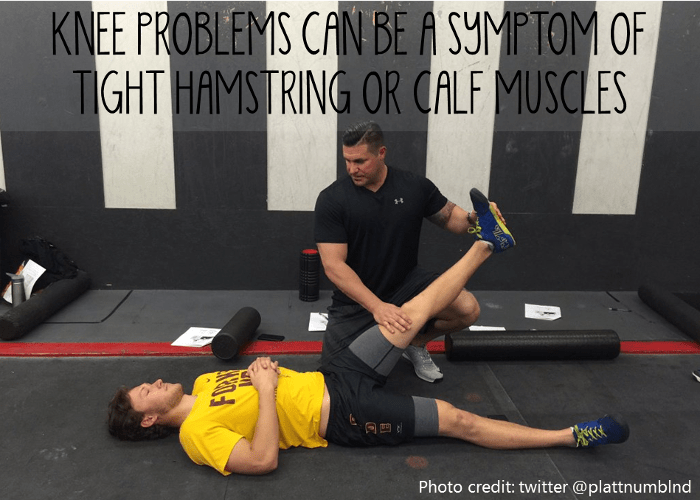 Or in other words, by releasing the tension that your tight hamstrings or calves might be putting through the joint. Nell explains: “You can do specific knee strengthening exercises, but when you have a knee injury it’s not always coming from the knee itself. The knee is a hinge joint, yes it has the ability to twist a little bit, but basically it’s a hinge, and its health relies on both your femur [thigh bone] and tibia [shin bone] pointing in the same direction. At the top of the femur, you have your hip, which rotates, and at the bottom of your tibia, you have your foot and ankle, which rotates. Those are the places in your leg where most of your rotation is supposed to happen. But if you have a slightly twisted hip or pelvis, then you will have a slightly twisted femur that will put a slight twist through your knee, putting your ligaments and cartilage under strain and increasing your risk of injury. Equally, if you have a stiff foot or ankle – that will also affect your knee. Our guide to ankle injuries is also worth reading, if you need it. Forget doing hundreds of leg raises to strengthen your knee. Your time might be better spent trying to release tension in your supporting muscles and to improve your balance and coordination. Nell’s own physiotherapy practice operates on a ‘release, stabilise, move’ model. It’s a formula that can work for you too. First, release the tension that’s causing the problem (or making it worse). Second, stabilise the knee so that you’re putting the correct forces through it. Finally, practice the patterns of movement that you need in a game so that you’re doing them properly. A good physio should be able to help you work out where you need to release any excessive tension. They’re professionally trained to be able to identify specifically where your body is misaligned and needs the release. Once the various pressure points have been identified, these can be released through stretching and massage, which can also be done on your own using a foam roller. After the tension has been released, it’s time to start stabilising the knee using a balance board or wobble cushion. This teaches the body to stabilise around the joint in an intuitive way, using your body’s own natural sense of balance to align itself. “Go out and get a wobble cushion, it will help you. If you’re doing any of the exercises wrong, it will tell you: because you’ll fall off it. They’re a fantastic bit of kit. Lastly, it can really help if you learn the most efficient ways to move. This can be done through SAQ (speed, agility quickness) training where proper patterns of movement can be taught and practiced under expert supervision. Practicing the movements you need for sport and concentrating on doing it with perfect form can help you get into good movement habits. 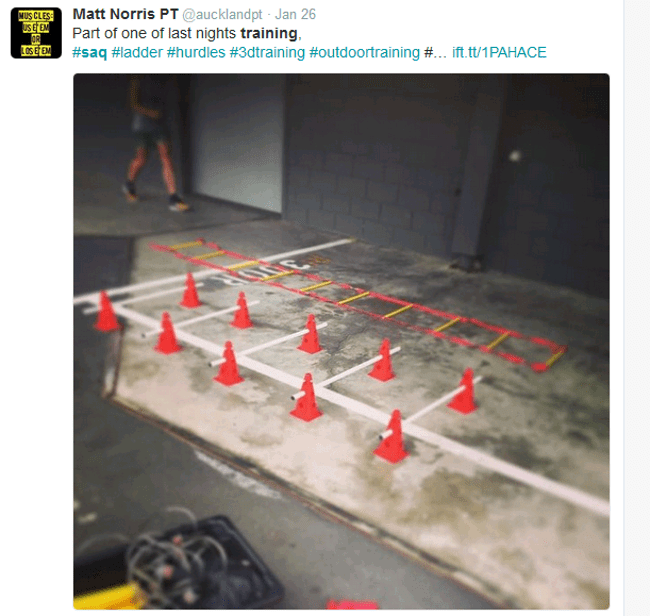 It’s about establishing patterns that will reduce the chances of ending up with a knee injury. 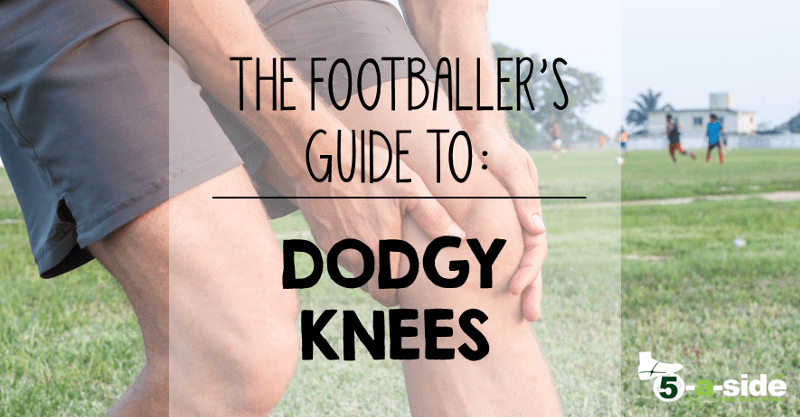 Knee injuries are the amateur footballer’s nemesis; the one thing they fear most. Football isn’t a game that is particularly kind on knees and injuries do happen. In many cases, however, a knee injury is the culmination of a number of factors that have led up to it: excess pressure on the joint, a lack of stability and lazy movement patterns. Once you’ve got a knee injury you’re more susceptible to future problems, but it’s not the end of the line. At this point you need to step up your efforts with flexibility, strength and balance training to ensure that you don’t relapse. Thanks goes to Nell Mead for her expert help in putting this article together. im 20 and play high standard football and i snapped my acl and wobble boards really do help the muscle in your knees. Thanks Marcus for adding your own experience to this. It’s nice to have someone who’s suffered an ACL injury give us advice on the things that help! Brilliant. I’m always worrying about my knees giving up! I’m going to look in to a wobble board, for sure. A good read. Hi Adam, I know the feeling. Fingers crossed that your knees have got plenty more games left in them!